Sketch of Littleton Fowler. Courtesy of Southern Methodist Univeristy. Image available on the Internet and included in accordance with Title 17 U.S.C. Section 107. 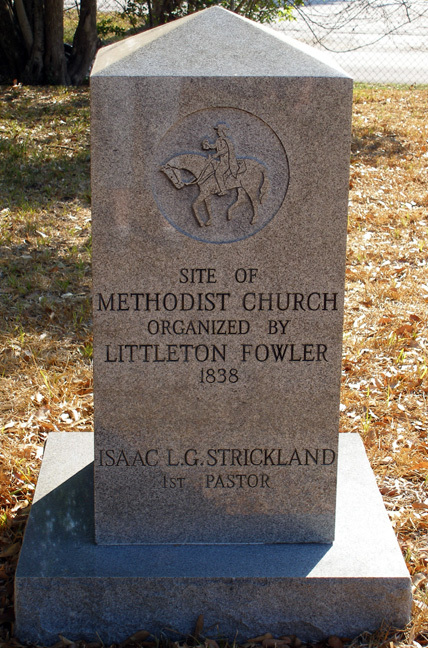 Headstone of a pastor at the site of the Methodist Church organized by Fowler. Image available on the Internet and included in accordance with Title 17 U.S.C. Section 107. FOWLER, LITTLETON (1803–1846). Littleton Fowler, Methodist minister, fourth son of Godfrey and Clara (Wright) Fowler, was born in Smith County, Tennessee, on September 12, 1803. In 1806 the family moved to Caldwell County, Kentucky. Converted at age sixteen, Fowler joined the Methodist Episcopal Church and was licensed to preach in 1826. He was admitted to the Kentucky Conference in 1826 and ordained a deacon in 1828 and an elder in 1830. After transferring to the Tennessee Conference in 1832 he served a year at Tuscumbia, Alabama, and three years as agent of LaGrange College. In 1837 he volunteered to go to the Republic of Texas as a missionary, along with Robert Alexander and Martin Ruter. Although he was delayed by illness, Fowler set out for Texas on August 22. he recruited John B. Denton in Arkansas, and they crossed the Red River into Texas in late September. Having preached in Clarksville and Nacogdoches, Fowler reached San Augustine on October 19 and held a week's meeting. He obtained a lot and raised a subscription of $3,500 for a church building. By mid-November he had obtained two more lots in Washington-on-the-Brazos. Continuing southwest, he joined Robert Alexander in a meeting at John Wesley Kenney's home, a center of Methodist activities. Fowler arrived in Houston on November 19 and was soon elected chaplain of the Senate. In December Ruter visited Houston, and the two missionaries formed the first Sunday school society in Texas. Ruter assigned Fowler responsibility for Houston and East Texas. After obtaining a church lot near the Capitol in Houston, Fowler returned to San Augustine, where, on January 17, 1838, he and Gen. Thomas J. Rusk laid the cornerstone of the Methodist church, believed to be the first Protestant church in Texas. Fowler also organized congregations near Crockett and Nacogdoches and obtained a lot and raised a subscription for a church in Nacogdoches. At the first regular meeting of the Grand Lodge of Texas Masons in April 1838, Fowler served as grand chaplain. After Ruter's death in May 1838 Fowler was appointed superintendent of the Texas Mission. His recruitment of Jesse Hord, Samuel A. Williams, and Isaac L. G. Strickland from the Tennessee conference, as well as several local preachers, assured the future of Methodism in Texas. Sketch of Wesleyan College. Courtesy of Southwestern University. Image available on the Internet and included in accordance with Title 17 U.S.C. Section 107. 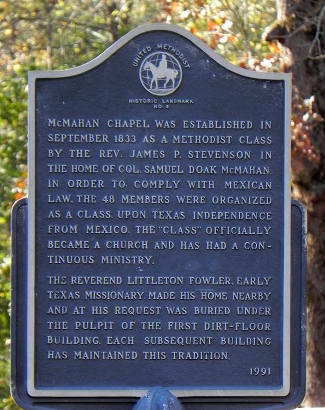 McMahan Chapel Marker. Image available on the Internet and included in accordance with Title 17 U.S.C. Section 107. When the Texas Annual Conference was organized in 1840 Fowler was appointed presiding elder of the San Augustine District. He served as agent of Rutersville College in 1841–42. From December 1842 to January 1845 he was presiding elder of the Lake Soda District. During that period, he assisted Francis A. Wilson and Daniel Poe in the founding of Wesleyan College in San Augustine and served as a trustee. As a delegate to the General Conference in 1844, Fowler submitted the resolution that led to the establishment of two annual conferences in Texas and voted in favor of the Plan of Separation that divided American Methodism (see METHODIST CHURCH). When the newly formed Eastern Texas Conference met for its first session in January 1845, Fowler was appointed to the Sabine District and elected a delegate to the convention that formed the Methodist Episcopal Church, South, the following May. On June 21, 1838, Fowler married Mrs. Missouri M. Lockwood Porter of Nacogdoches, a native of Kentucky. They had a daughter and a son, Littleton Morris Fowler, who became a prominent Methodist minister. Fowler died on January 29, 1846, at his farm home in Sabine County and was buried beneath the pulpit of McMahan's Chapel. The Fowler Institute, a Methodist school established at Henderson in 1847, was named in his honor. Dora Fowler Arthur, "Jottings from the Old Journal of Littleton Fowler," Quarterly of the Texas State Historical Association 2 (July 1898). Dora Fowler Arthur, "The Reverend Littleton Fowler: Missionary to the Republic of Texas," Texas Methodist Historical Quarterly 1 (October 1909). Littleton Fowler Papers, Bridwell Library, Perkins School of Theology, Southern Methodist University. Walter N. Vernon et al., The Methodist Excitement in Texas (Dallas: Texas United Methodist Historical Society, 1984). Laura Fowler Woolworth, comp., Littleton Fowler (Shreveport, Louisiana, 1936). Handbook of Texas Online, Norman W. Spellmann, "FOWLER, LITTLETON," accessed April 22, 2019, http://www.tshaonline.org/handbook/online/articles/ffo25.